Hello, Crafty Friends!! And Hello November!! Well, with a heavy heart I must say goodbye to my all my Halloween decorations. I kept them up for as long as I could before hubby took me by the hand and finally told me it was time to let it go. So, out with the skulls, spiders, & witches... and in with the gourds and cornucopias! Today, I'll share how I made quick and easy fall decor from recycled glass spaghetti jars! 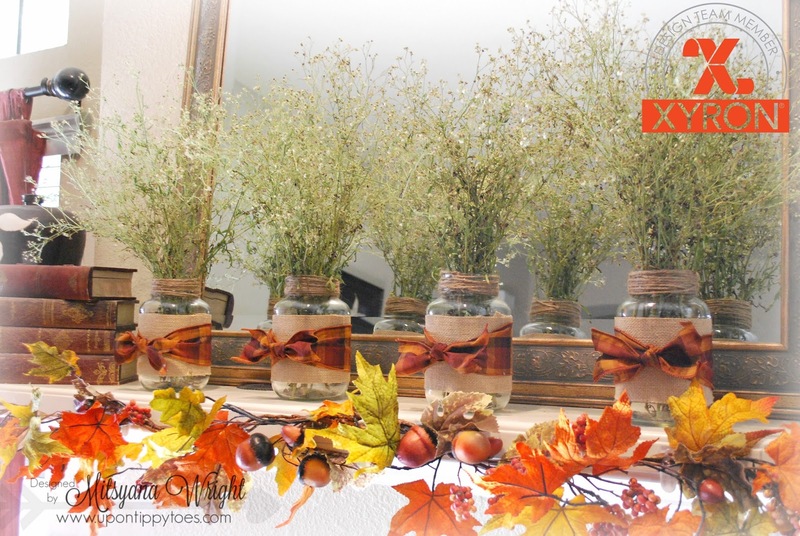 I start by cleaning and removing the labels off of these old mason jar type of glass spaghetti jars. My family eats a lot of spaghetti, and the glass jars they come in are too nice to throw out. So, I often keep them on hand. I clean them out and store them for later to recycle and/ or repurpose them. Simple soapy hot water is all I need to remove these labels. If I ran into an occasional rough spot, I simply applied a little bit of goo gone and gave a good rubbing with a paper towel to remove whatever remnants remained. I use a measuring tape to measure the circumference. I also measure the height of the areas I want to be covered and decorated. These particular jars have a recessed center. I shall use this area as a marker to where I wrap my burlap and ribbon. The jars measure about 13.5" inches around and the recessed area measures about 3.5" high. 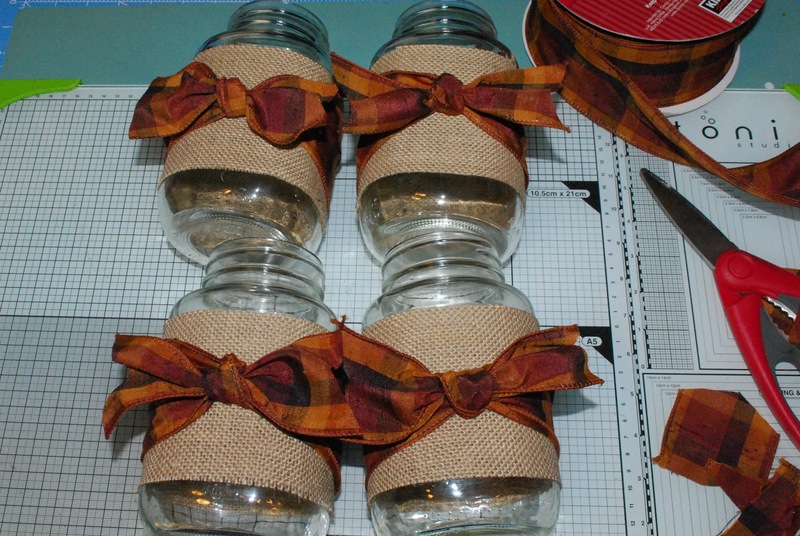 Because the circumference was larger than my 12" sheets of burlap, I instead cut 2 - 7.5" pieces of burlap for each jar. I cut the burlap slightly bigger than the circumference to give an overlap. I ran my burlap pieces through the Xyron Creative Station then burnished the burlap with a bone folder before peeling off the protective film. 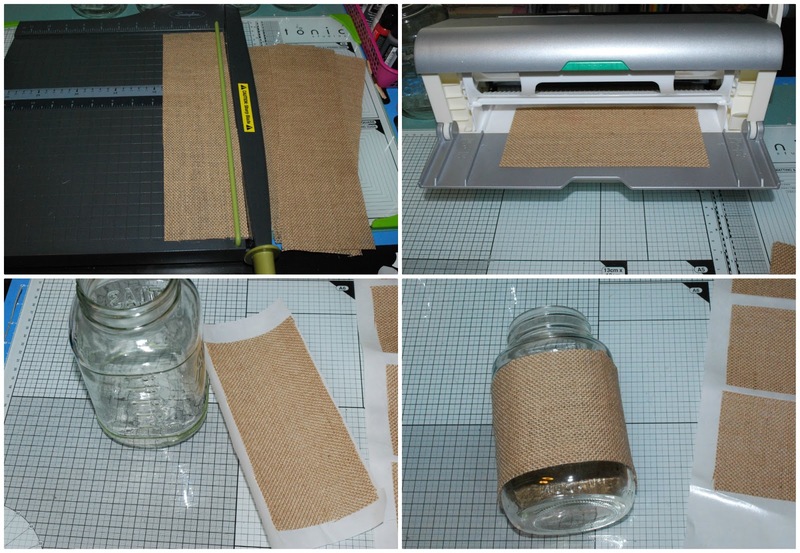 Then applied the strips to the center of the glass jars. Then wrapped them with a 2.5" wide wired ribbon around the center. 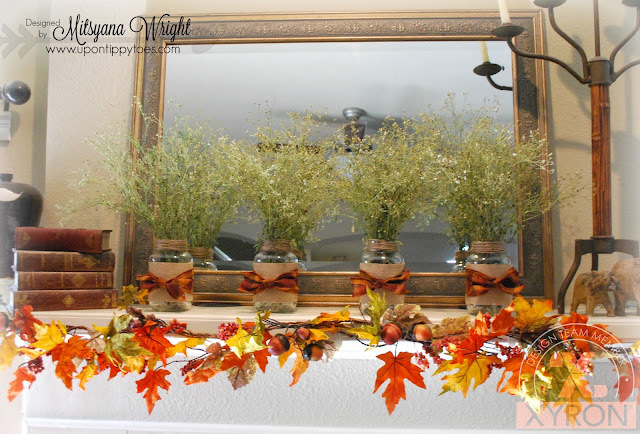 I used approximately 25" of ribbon for each jar. 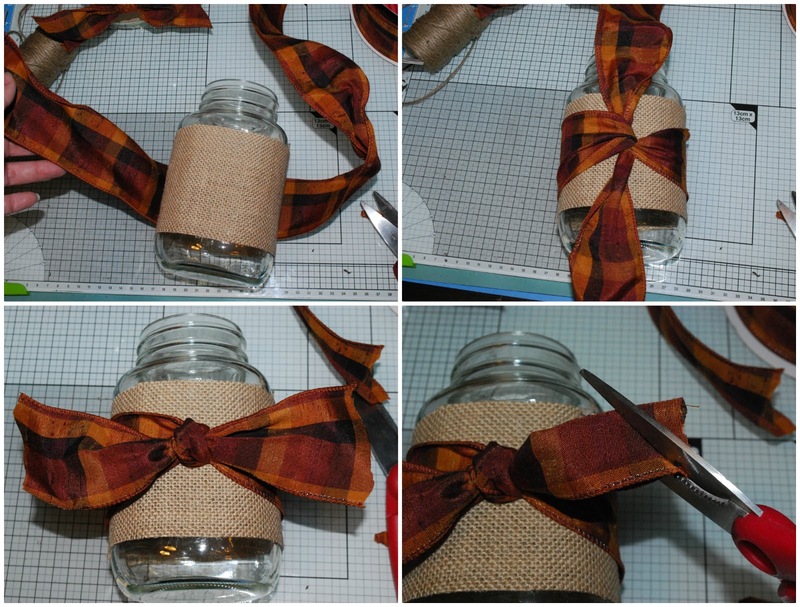 I tied each ribbon into a simple knot then trimmed the ends at a diagonal to give them a "dovetail". 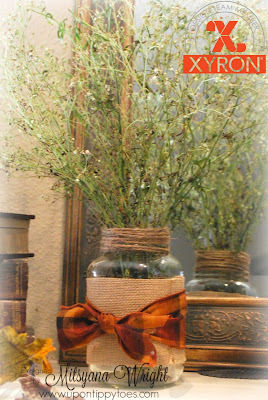 The burlap gives a nice rustic look. 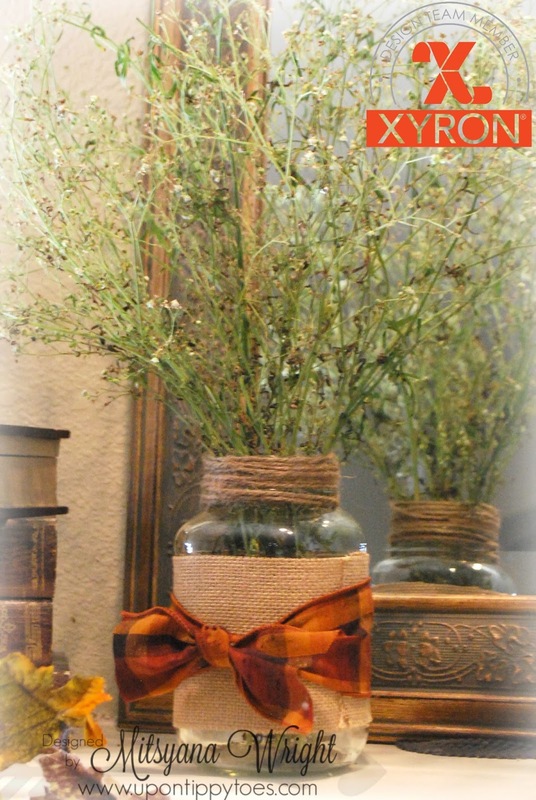 Pairing it with deep orange and brown colored plaid ribbon is an easy way create a "FALL" feel to the look. 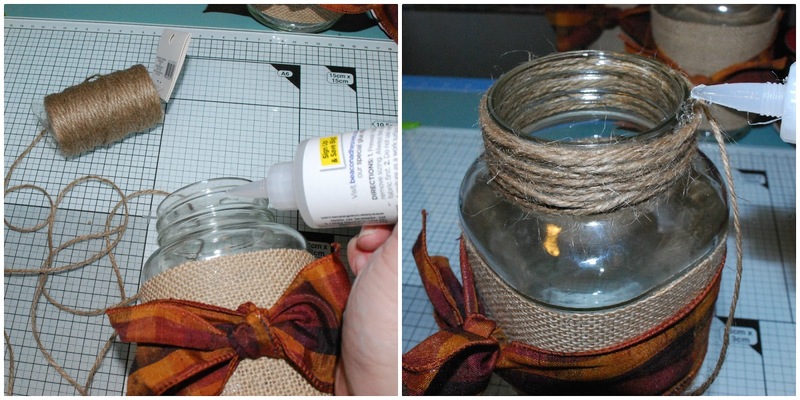 Then, I glued and wrapped the lip of each jar with jute twine to finish them off. And filling them doesn't need to be difficult or expensive. My backyard borders a pasture and is constantly filled with different wildflowers and grasses. Among them in this slightly tall grass that is similar in look to baby's breath but with smaller white blooms. I'm not sure what it's called but when bunched and bundle together it really completes the rustic feel I was going for. And when positioned in front of a mirror is made to look a whole lot fuller than it really is! I hope you enjoyed my upcycled project and it makes you give those usually discarded jars a second thought. Repurposing them isn't just good for the environment, especially during the holidays, it's good for your wallet too! !